As I may have mentioned a time or two in the past, I am not a huge fan of New Jersey wines. They can protest all they want that the soil and climate in our area is “Bordeaux like” but, I’m not buying it. So many of the local wines contain blueberries and peaches and strawberries and the ones that don’t probablywould be enhanced by adding some. Certainly, there are exceptions to this generalization (A Sharrott Winery Cab Franc comes to mind), but not many. 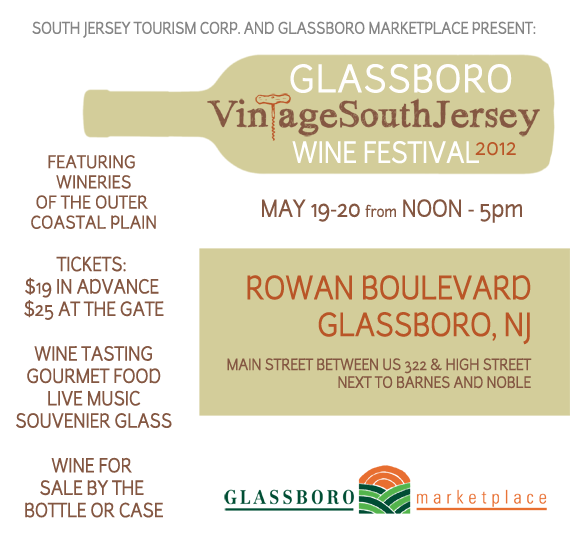 Still, there are many who do enjoy sampling the local wines and for those I would suggest next month’s GLASSBORO VINTAGE SOUTH JERSEY WINE FESTIVAL which takes place from Noon till 5:00 PM on both Saturday and Sunday May 19th and 20th. The festival will be held on Rowan Boulevard (Main Street between US RT 322 and High Street next to the Barnes & Noble). Tickets are $19.00 inadvance at www.glassboromarketplace.com or $25.00 at the gate. Your admission includes wine samples from 13 local wineries, all members of the Garden State Wine Growers Association, a souvenir glass, gourmet food, live music and the opportunity to purchase wines from all of the participating vintners. Yes, I am thinking about attending because you should always keep an open mind and one never knows when something could happen to totally change long-held perceptions. 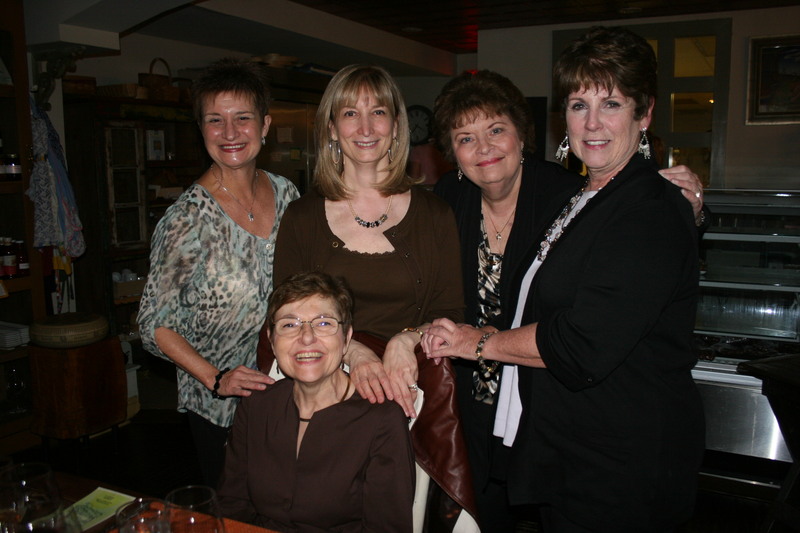 NEW BYOB WILL SOON ARRIVE IN SWEDESBORO, WOOLWICH TWP. 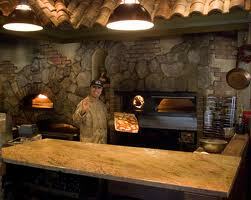 The man standing in front of his brick oven at Toscana in Mullica Hill, NJ is Chef Mimmo. 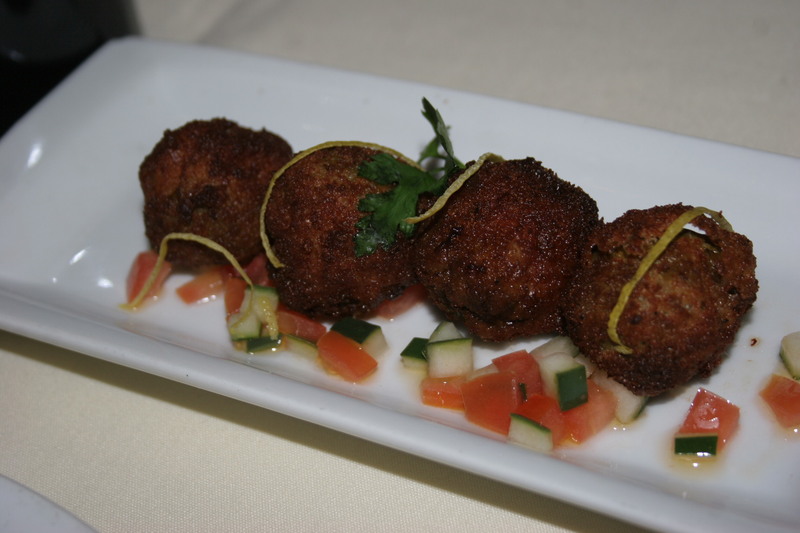 Four of us had a wonderful dinner there on Friday evening and learned, among other things, that Chef Mimmo is planning on opening a new restaurant on the site recently vacated by Barone’s Tuscan Grill in Swedesboro, Woolwich Township. 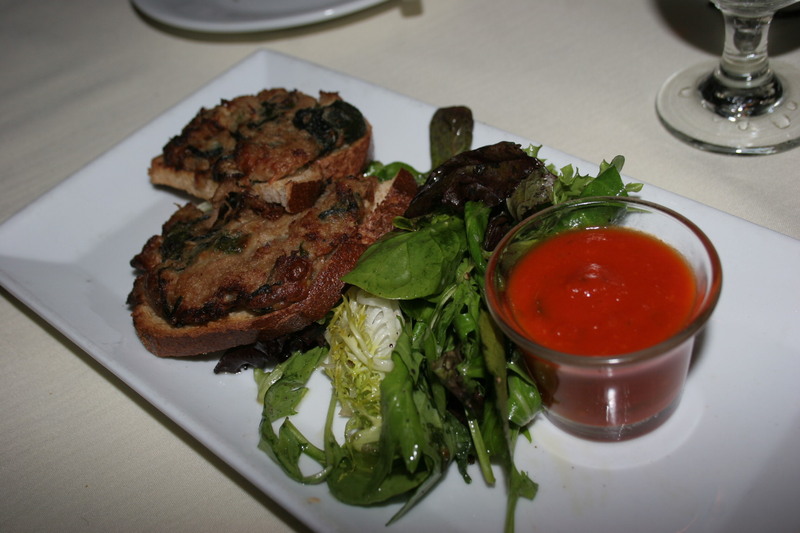 As I have mentioned many times on this blog, Barone’s Tuscan Grill has been, and continues to be, the most read article on this blog. After two years I still have no idea why so many people flock to that article. It was a restaurant serving mediocre food with a history of service complaints by both customers and employees. Those may have been reasons for its recent demise but they still don’t explain the interest by my readers. This is certainly an area of constant growth even now that will grow more as we come out of the housing crisis. 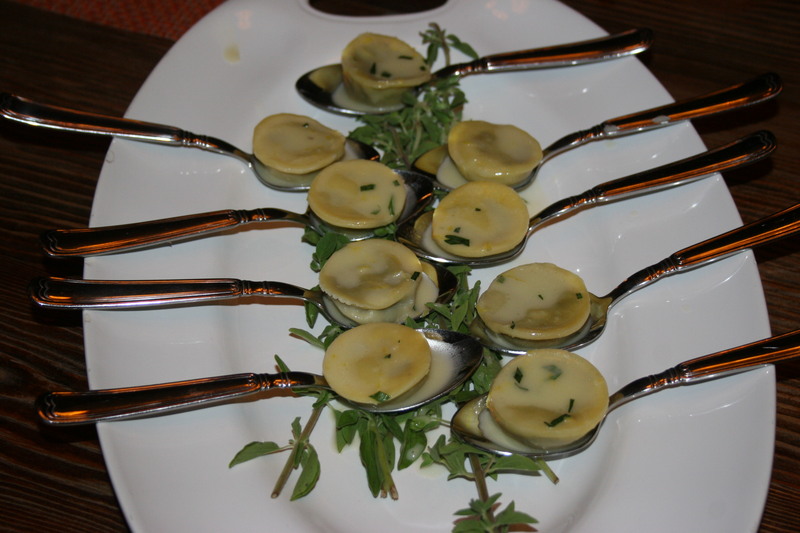 It is apparent that the residents are starved (no pun intended) for good places to eat and I am betting that Chef Mimmo’s restaurant will quickly become a” foodies” favorite. 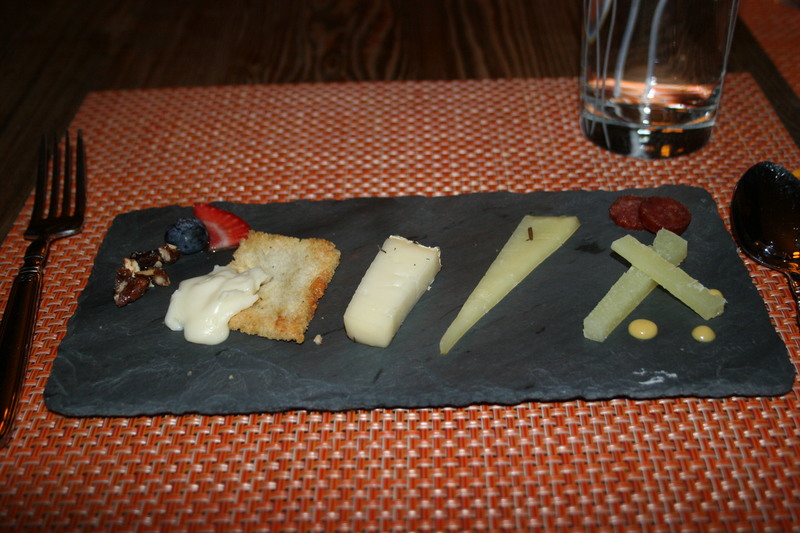 I have to confess that I was hoping NOT to like my dinner at Luke Palladino’s in Northfield, NJ. Last summer, I was attempting to make reservations for ten of us and Luke went into a ten minute rant as to what would happen if we failed to show for our reservation without calling 24 hours in advance. He took my credit card number and explained there would be a $50.00 per person charge PLUS tax and gratuity. 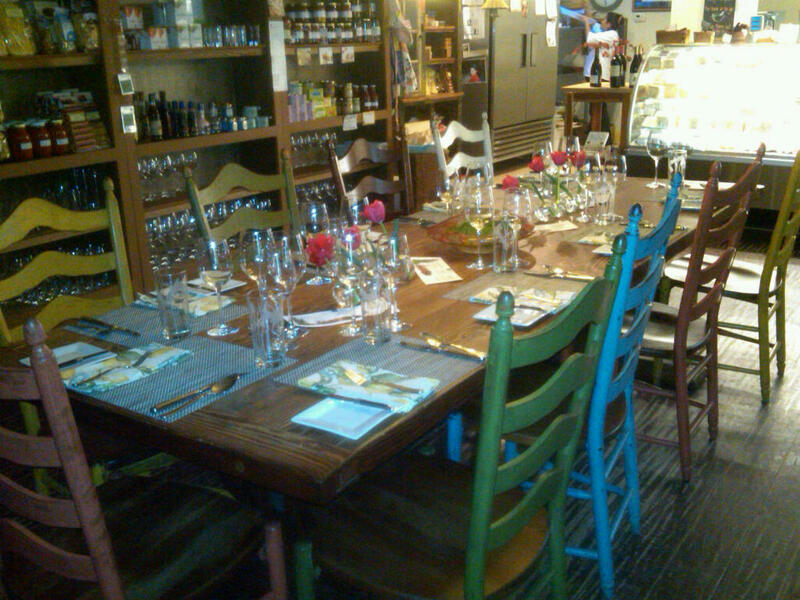 I understand the importance of keeping reservations, especially when it’s for ten people in a place that only seats 30. I found it a little insulting though to have such focus on the dire consequences of such actions. I called a couple of days later and cancelled just on general principles. This time it was just my wife, Kathy and our friends who live down near the shore, Mike and Mya M. celebrating a “long time no see each other” event. 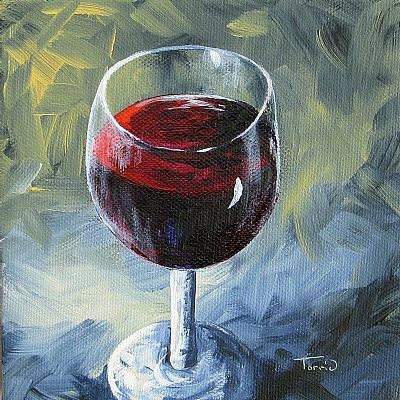 I had brought with me a couple of nice bottles of wine which we shared. 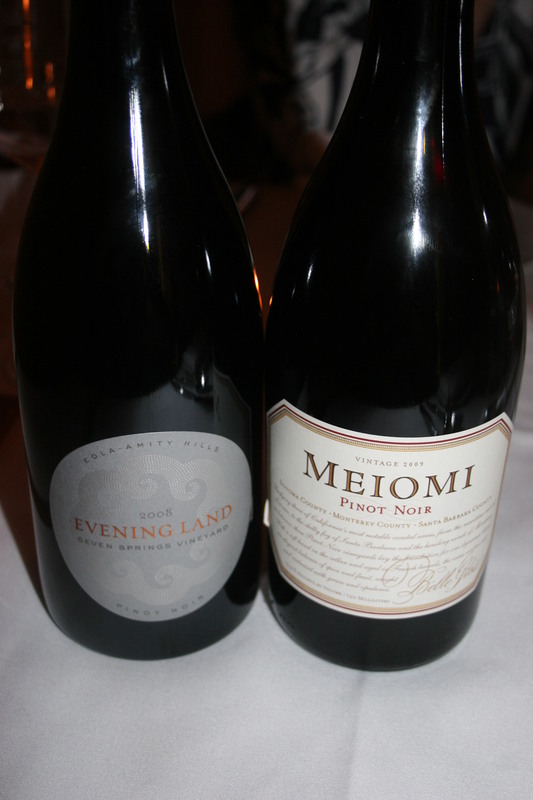 The first was the 2006 Melville, Estate, Pinot Noir. This one had a soft bouquet of spring flowers and strawberries on the nose and lots of spice and tea flavors intermingled with black cherries and soft tannins leading to a smooth, lasting finish. The second wine, a 2005 Keenan Napa Valley Merlot helped me remember just how good a nice Merlot can be. This had bright fruit flavors and a smoky tobacco essence and went really well with many of the meat dishes that we enjoyed. 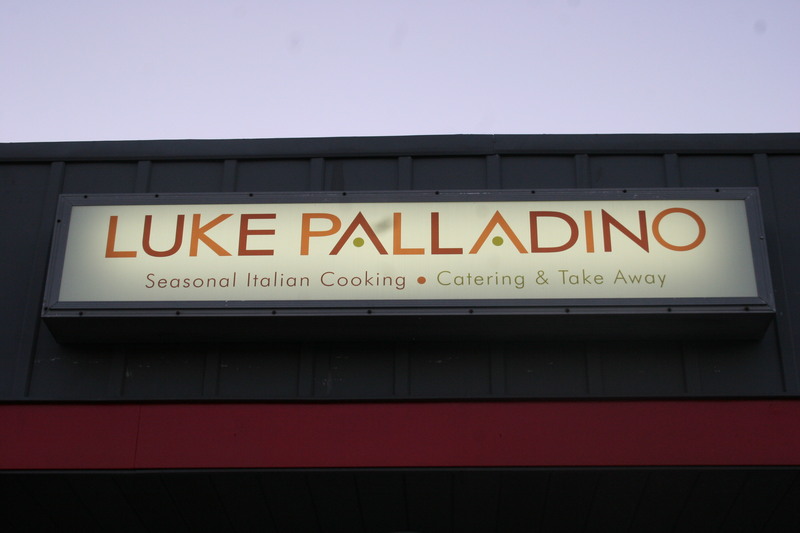 The menu at Luke Palladino’s is designed to encourage family-style samplings of several different courses. 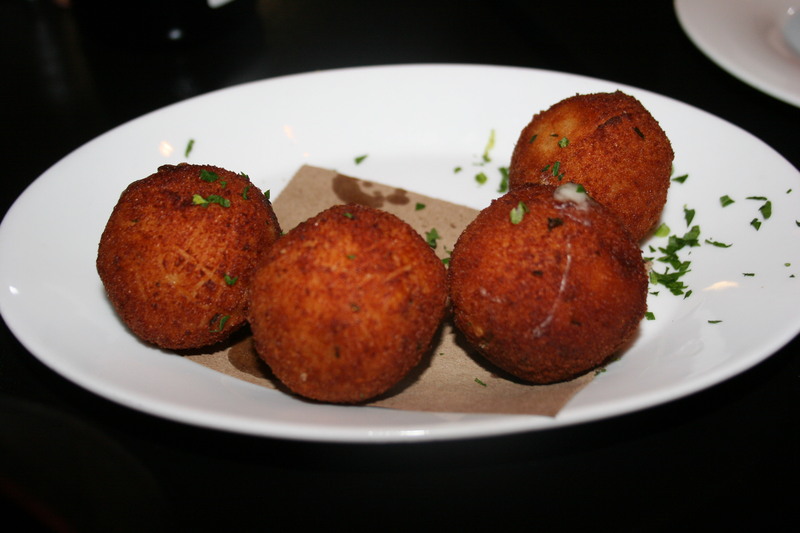 We started with Arancini, crisp risotto fritters filled with truffled sottocenere cheese and scallions. There was one for each of us and each of these fried goodies were stacked with great flavor. I have had these at a few different places and these were clearly the best of them all. I have had a habit recently of delaying my reviews way beyond what they should be. 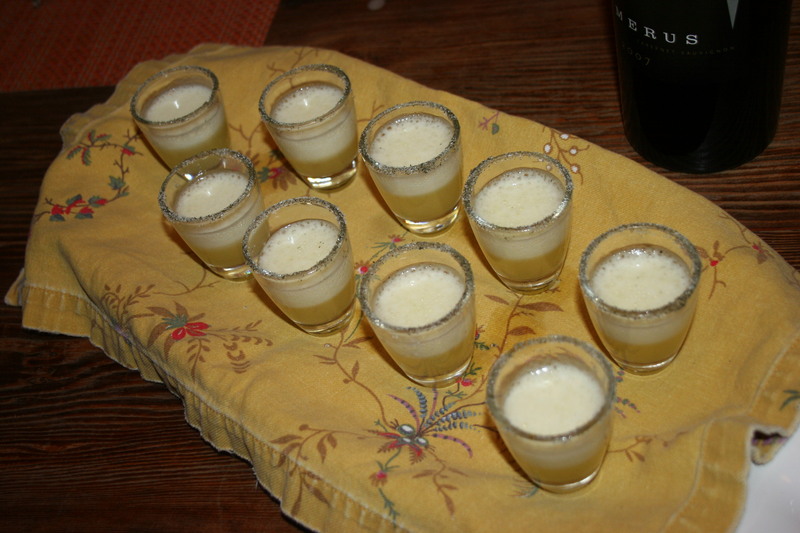 I guess all writers experience these droughts and if I were really smart I would continue this pace of delayed sharing when it comes to the dinner that four of us had on Friday night of this 2011 Memorial Day Weekend. 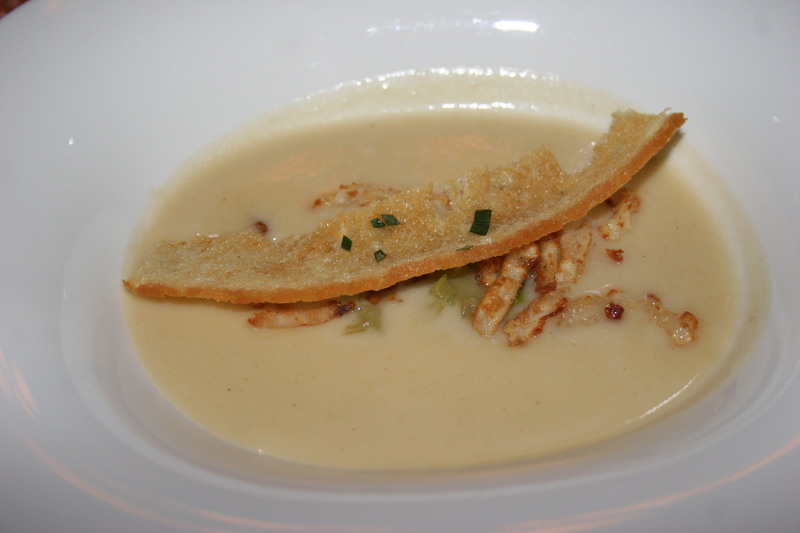 We dined at the very recently opened The Farm and Fisherman at 11th and Pine Streets in center city Philadelphia. Anyone reading this would be doing yourself a huge favor if you stopped now and made your reservation prior to what I am about to write. The reason I make that suggestion is because The Farm and Fisherman is an undiscovered gem on the Philly restaurant scene. 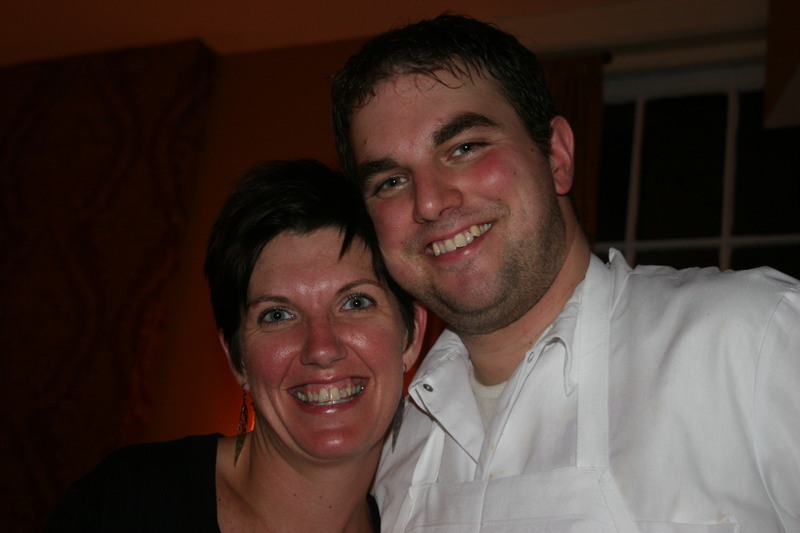 This 30 seat culinary temple is the creation of Josh Lawler and his wife, Colleen . 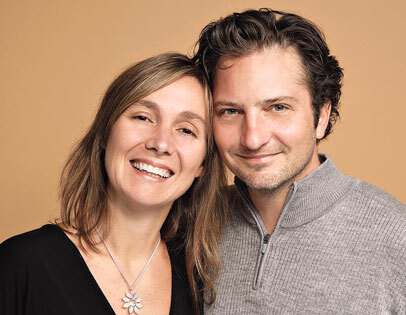 Josh and Colleen have spent the last 10 years in New York with Josh doing the honors as Chef de Cuisine at the highly acclaimed Blue Hill at Stone Barns which Food and Wine Magazine declared “One of 10 Life-Changing Restaurants”. 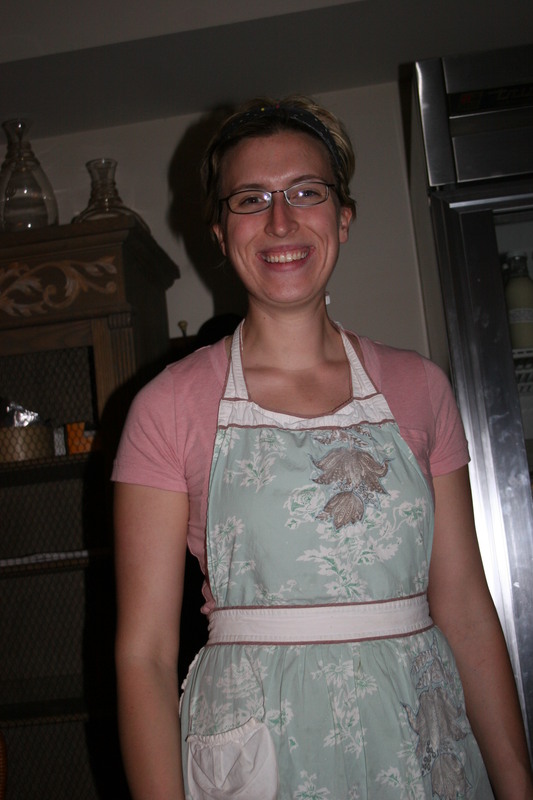 Colleen runs the front of the house and she is an accomplished chef herself having a culinary degree from Drexel University and experience at many New York restaurants including BLT Market at the Ritz-Carlton and Picholine. 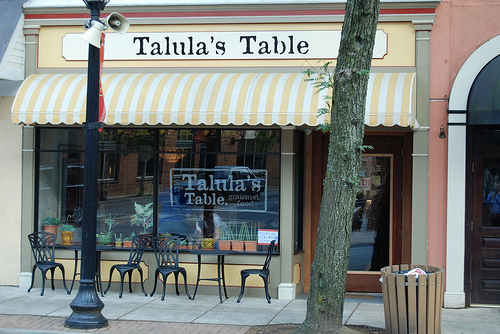 They have returned to their home town to fulfill their dream of having their own restaurant. We arrived for our 7:30 reservation and I have to confess to a certain amount of pre-dinner apprehension. I had studied the menu in the days leading up to our dinner and I wasn’t totally convinced this was going to be my kind of place. Chef Lawler’s committment to farm fresh food and local ingredients had some items listed that weren’t exactly encouraging to a “meat and potatoes” guy like myself. 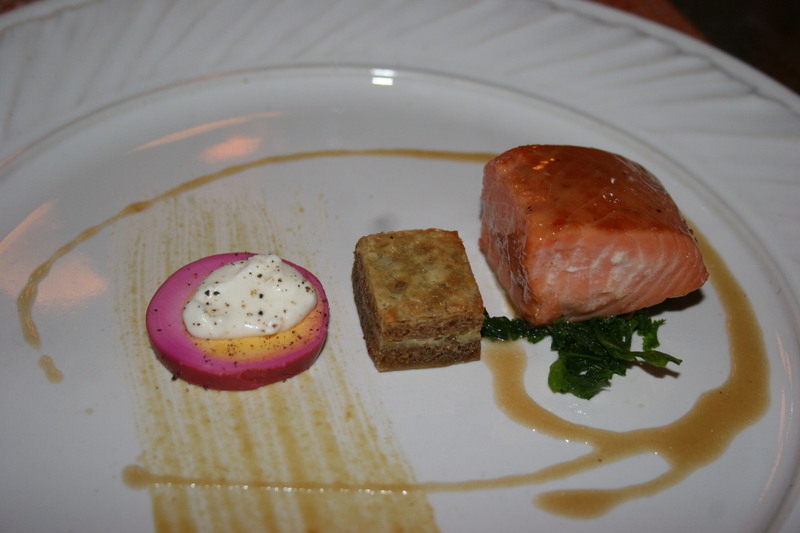 The Farm and Fisherman features a three course menu with four items available under each course. That’s a total of 12 offerings and the four of us managed to damn near try them all. Here is how we started. 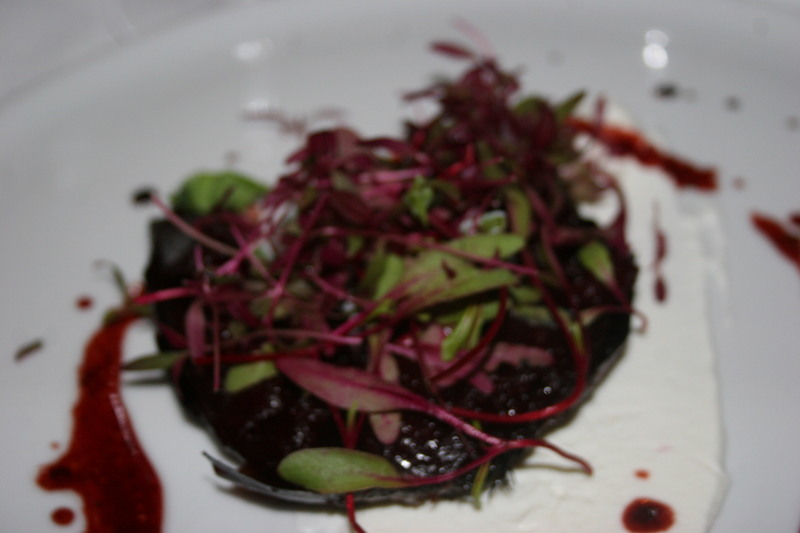 I began with the Bloody Beet Steak, yogurt, shallots, pan drippings, bull’s blood. My wife, Kathy, was slightly shocked that I would order beets but I decided as long as I was here I would be open to the adventure. The dish was outstanding and the flavor of the beets mixed with the yogurt and the drippings made for a delicious start to my meal. I tried to tell the others how good my selection was but I couldn’t get them to listen because they were too busy being effusive over how good their first course was. 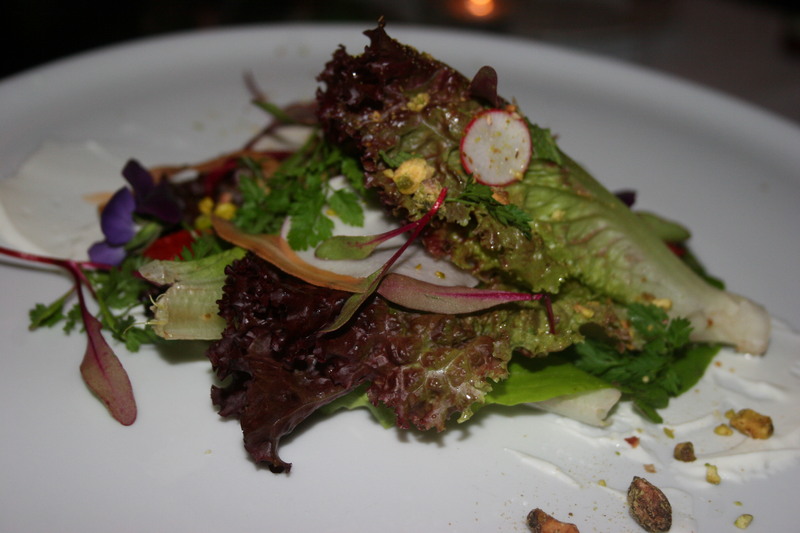 Kathy and Carol had chosen the Bucks County Head Lettuce, fromage blanc, pistachios and spring vegetables. They raved about how good their salad was and I actually heard Carol say between bites “maybe the best salad I have ever eaten”. There was no question we were off to a good start with our meal. 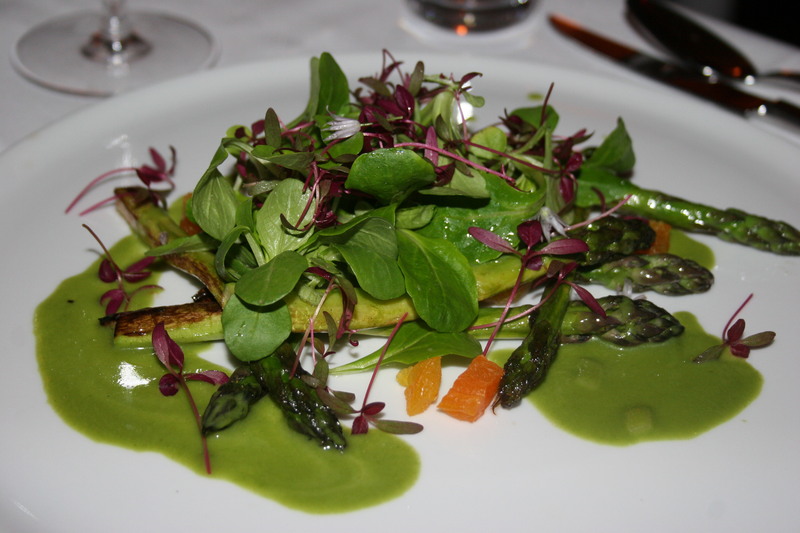 Joe had selected the Jumbo Asparagus, mache, apricots, chive blossom and green garlic sauce. I wish I had taken a picture of his plate when he was done because there wasn’t the slightest indication that anything had been on this clean, white plate. It was solid testimony to the fact that he LOVED his dish. He let each of us sample a portion and it really was great. Carol even though it MAY have been better than the salad she had just declared “the best she had ever eaten”. 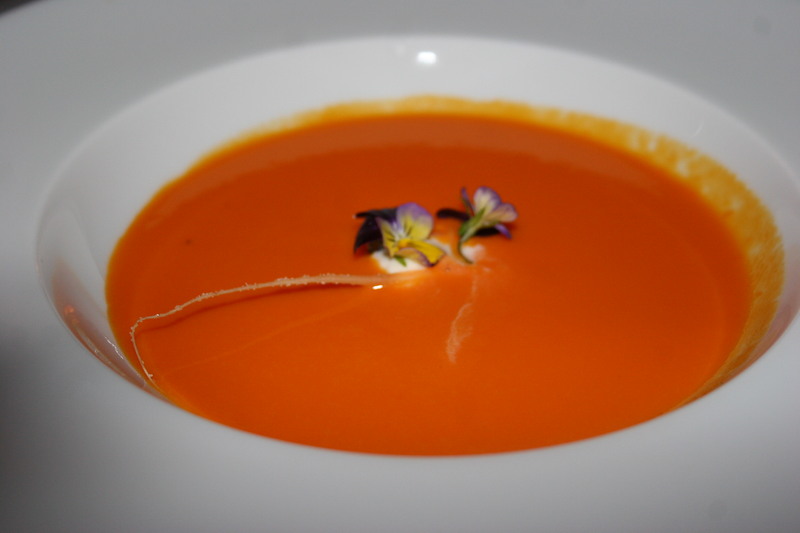 Carol next selected the Chilled Carrot Soup, angelica, local ginger and buttermilk. She was making little noises indicating she was enjoying something really special. I was wondering what could be THAT good about a chilled carrot soup but when I tasted a sample spoonful I could see that Chef Lawler had worked some special magic on this offering. Maybe it was the buttermilk? 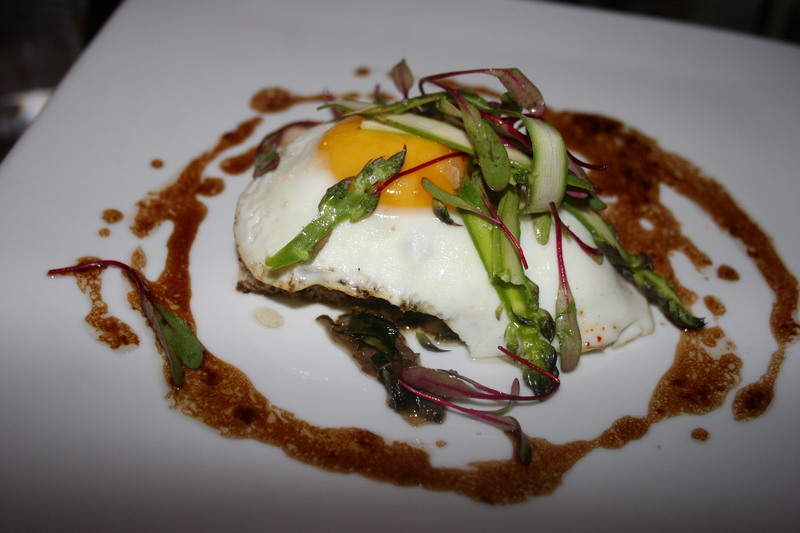 Kathy had the Jennings Farm Egg and Oxtails, whole wheat toast, asparagus and pickles. You would have had to twist my arm to get me to order that one but she declared it wonderful. I can’t get past eggs as simply a breakfast meal so I am missing out on a lot of the trend in haute cuisine. 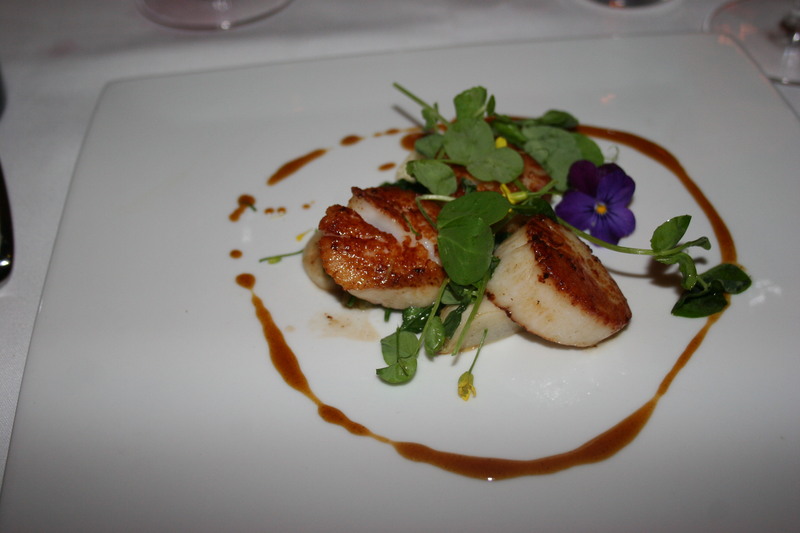 Anyway, I had no time to dwell on an egg that I wasn’t having because my Barnegate Light Scallops, Hakurei turnips, wild spinach and green tomato sauce was sitting perfectly plated and prepared in front of me. Great flavor combinations and just the right seasoning made this plate a special treat. By now, all of our fears had dissipated and we were just enjoying something really special. I should add that the meal began with a piping hot Parker House roll with just the right hint of salt in the warm crust and some excellent house butter that just melts beautifully into the warm bread. We each asked for and received another roll during our meal. The Farm and Fisherman does not rush their course one after another. You have ample time to enjoy your wines and engage in conversation. We were there for two and a half hours and Colleen was engaging and conversing with each table. 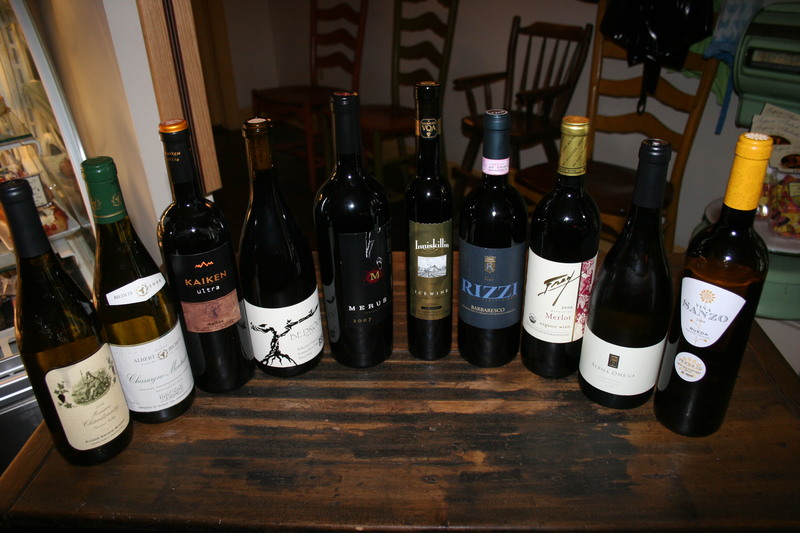 I haven’t mentioned our wines for the evening. Both Joe and I must have been thinking along the same lines that the food appeared to be a bit lighter than the steaks and chops that would require a cabernet as we both brought Pinot Noirs. 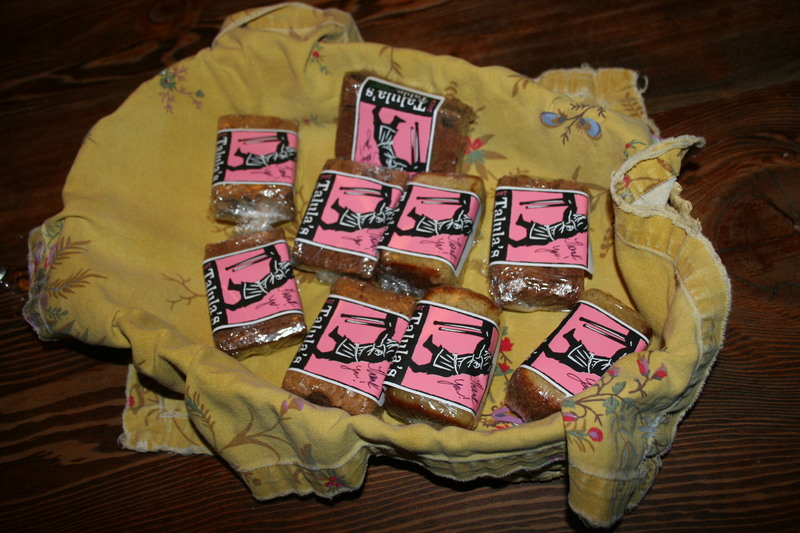 Joe’s was the 2009 Belle Glos, “Meoimi”. Pinot Noir. This is a blend of Pinot Noir grapes from Sonoma, Monterrey and Santa Barbara Counties and offered sweet cherries and blackberry notes with floral tones. It was a nice easy drinking wine. Much the same could be said for my 2008 Evening Lands, Seven Springs, Pinot Noir. 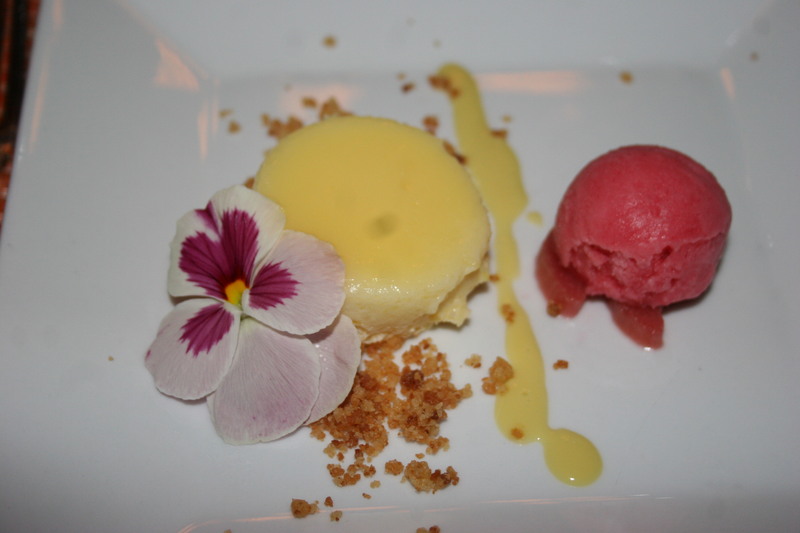 Light strawberry and lavender flavors offered a nice accompaniment to all of our dishes. 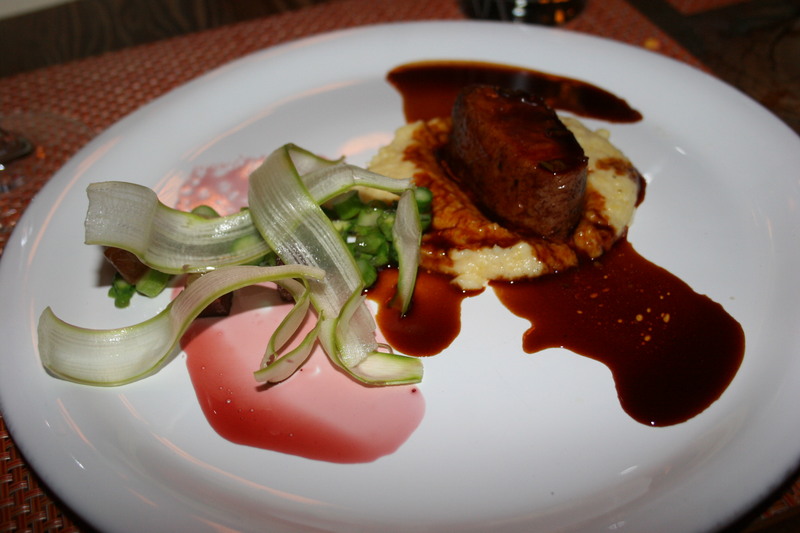 The first two courses had set a standard of excellence for the evening and we couldn’t wait to find out if our entrees would continue the parade of great food. 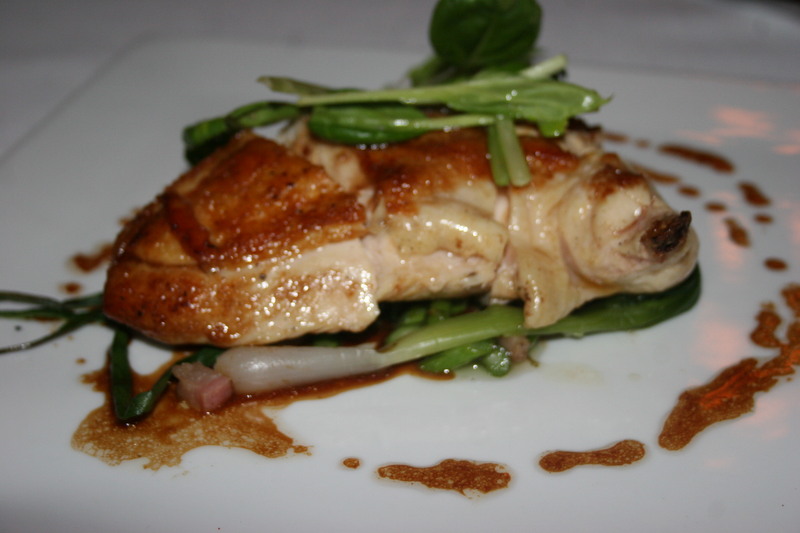 Kathy and Carol each ordered the Shady Brook Farms Organic Chicken, asparagus, turnip-raisin puree, spring onions. Hey, who else is doing a turnip-raisin puree?? The women thought the chicken was perfectly prepared and were both happy with their selections. 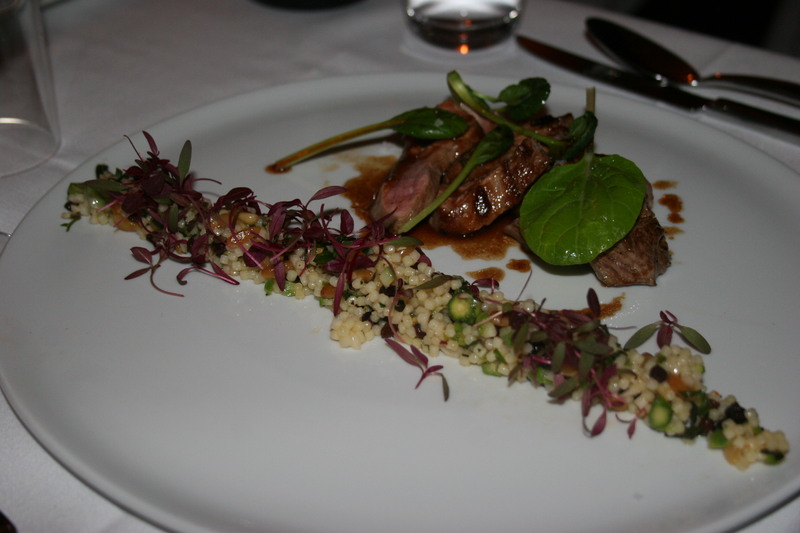 Joe had the Livengood’s Farm Lamb, Spring pasta salad, asparagus, currants and pine nuts. The pasta salad was a unique presentation, the lamb was perfect medium and Joe was totally happy with the entire dish. 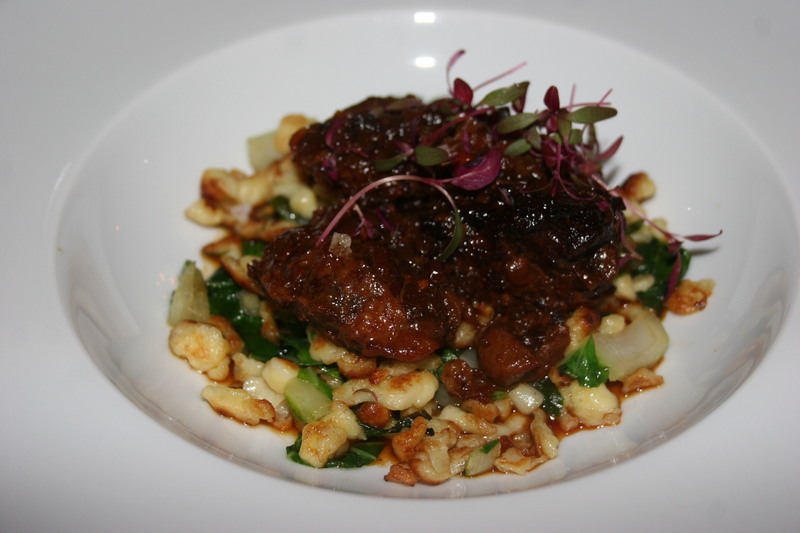 I had considered the chicken, as I almost always do, but went with the Braised Berkshire Pork Cheeks, farmer’s cheese spaetzle, bok choi and wild garlic mustard. The pork cheeks were incredibly tender, the spaetzle a perfect marriage with the meat and the sauce just made this entire dish something truly remarkable. For me, this was the perfect ending to a great dinner. We ordered two desserts to share. 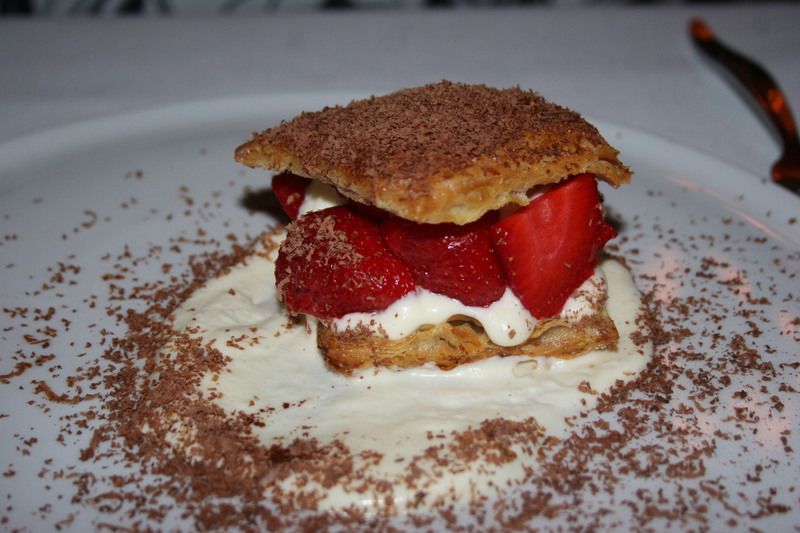 On the left is strawberries and creme fraiche in a puff pastry sandwich. This was possibly the only thing resembling a miss the entire evening. It was fresh and looked beautiful but there wasn’t a lot of taste in this one. 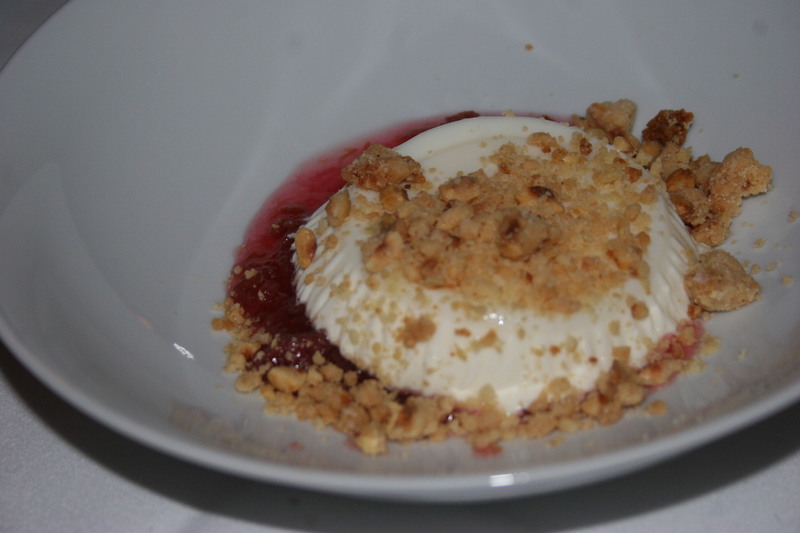 The other dessert, a panna cotta with berries and glazed sugar crumbles, was mush more flavorful and we all enjoyed that one. What a wonderful evening of great food and comfort. 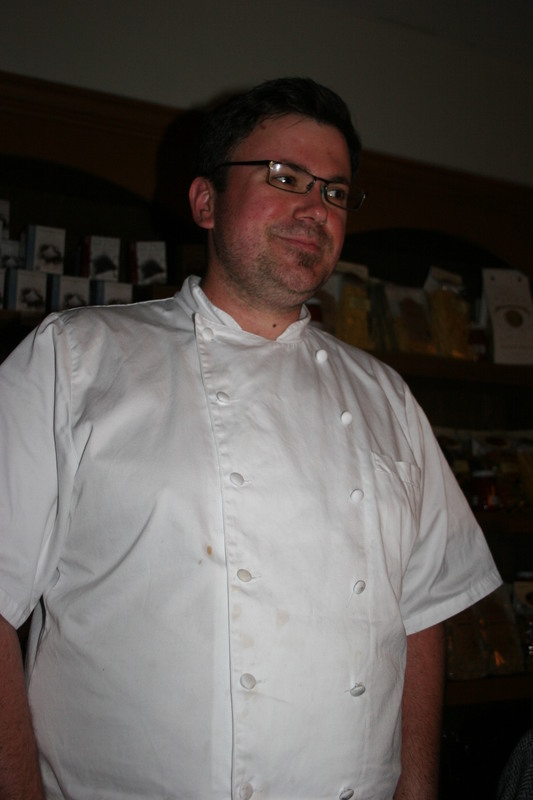 The Farm and Fisherman changes their menu slightly each evening and probably dramatically as the seasons change and Josh and Colleen take advantage of what is currently available from local farmers. My only fear is that this place will soon be discovered by the true “foodies” in the Philly area and reservations will be hard to come by. I strongly suggest you make yours NOW. 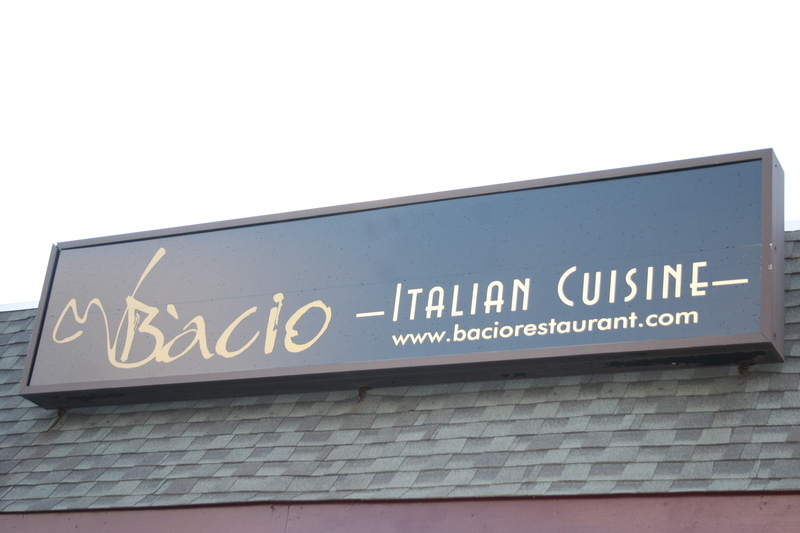 Bacio Italian Cuisine is located on busy Rt. 130 in Cinaminnson, NJ. and it’s a bit of a ride from our homes in Washington Twp. A couple of our dining companions had been there previously and, if their memory was correct, they weren’t totally sure it was worth the drive. It was a BYOB that I had read about often and I wanted to find out for myself what it was like. Six of us made the ride last Saturday evening for a 7:30 reservation. (I have had one of these those writing “lulls” and it’s now been 3 weeks since our visit and I will attempt to recall the evening. I do know we all enjoyed our meal). I thought about saying that we didn’t bring any wine with us but, in keeping with a policy of total honesty, I had with me a 2009 Cupcake, Red Velvet, Wine. This is a zinfandel blend and there is a story to go with it. 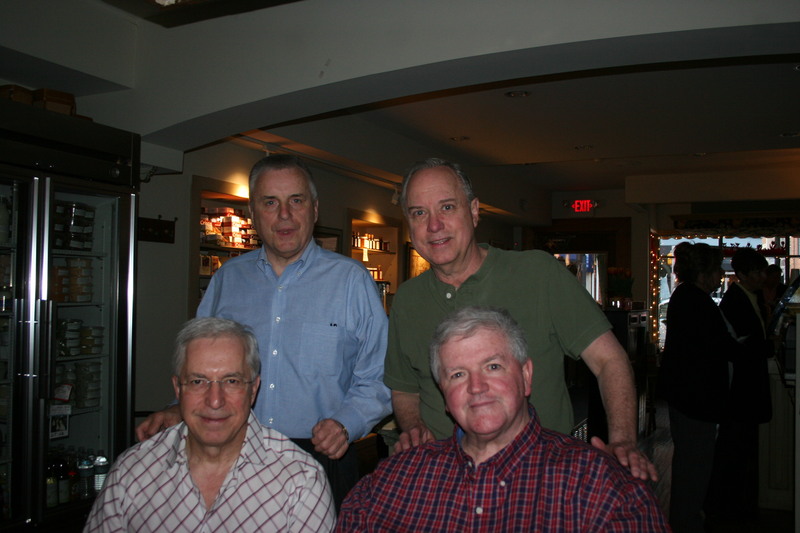 Several months ago I attended a wine tasting at The Mansion in Voorhees, NJ with my friend, Gerry B. There were hundreds of wines available and one of the producers tending a booth implored me to try the Cupcake Red Velvet. I tasted it to be nice and was slightly surprised that it wasn’t bad. The recent sale at $7.49 a bottle convinced me to give it one more try. It didn’t really deliver. The initial mouth feel is ok with some bright fruit and pepper but it disappears quickly, something that is almost a trademark of weak wines in that price area. 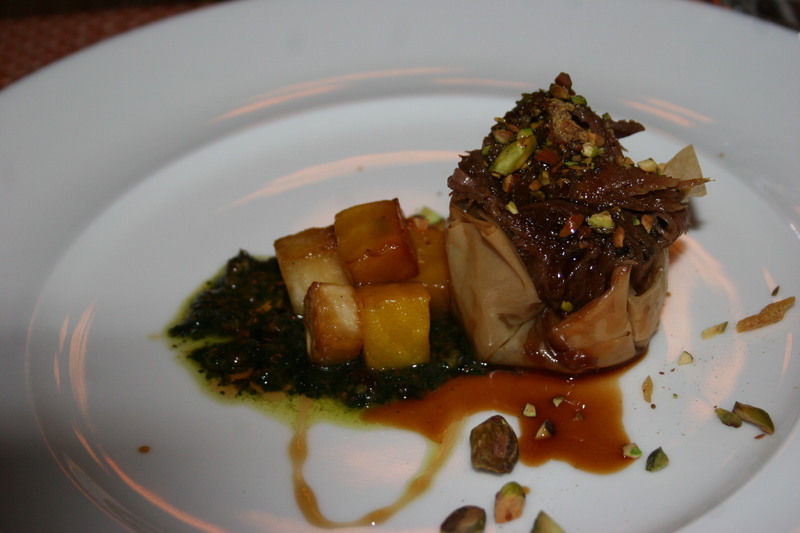 Bacio featured a nice menu with lots of tempting choices. 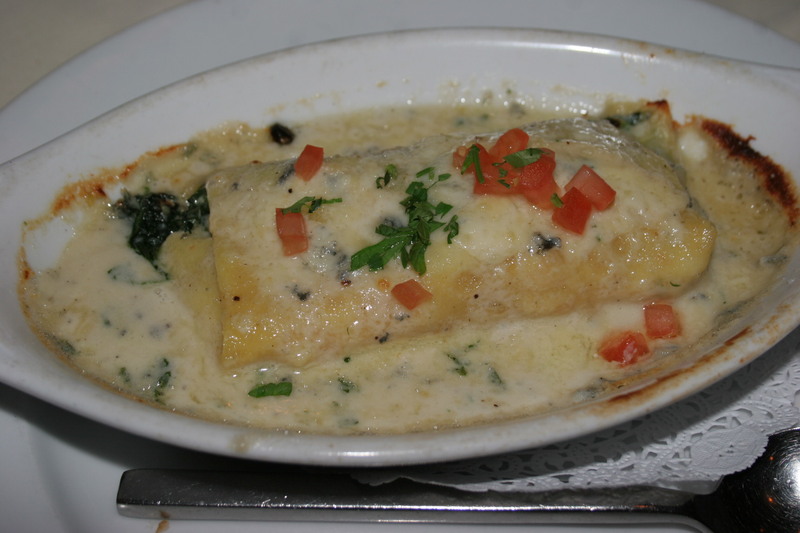 I totally enjoyed my choice of an appetizer, the Crispelle della Nonna, Italian crepe stuffed with jumbo lump crabmeat, spinach and artichokes, baked in a gorgonzola cream sauce. This would have made a nice entree with an additional crepe but by itself was a great start to the meal. 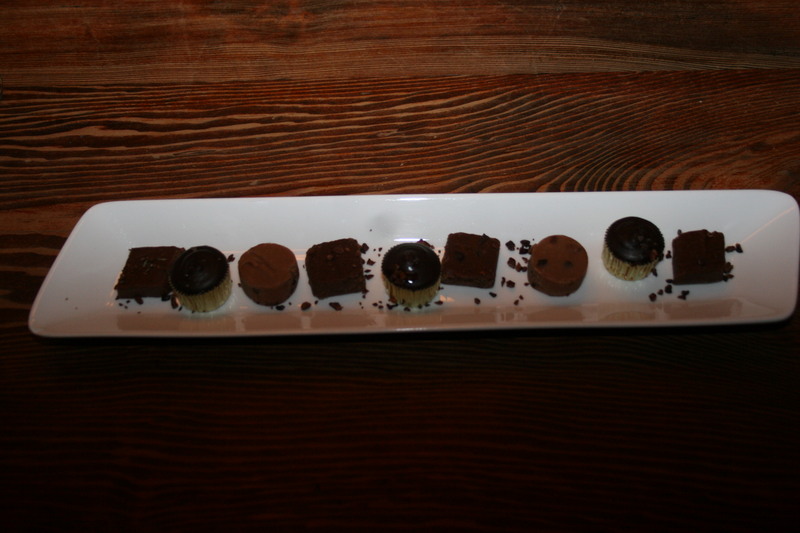 Here are some of the other items that our party of six chose to start off their meal. Left to right we have the Roast Pork Bruschetta, slow-roasted pork, broccoli rabe and aged provolone baked on top of Tuscan-style, hearth-baked bruschetta. 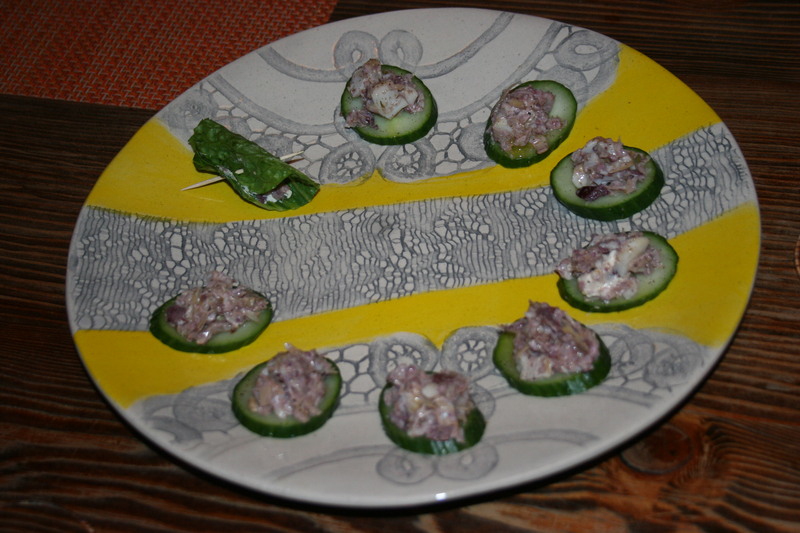 The interesting concoction titled Olive all Ascolana, fried olives stuffed with ground veal and pork and served with a cucumber salsa. I almost went with this one but Joe B. commented that it was just OK. My wife, Kathy, went with the Arugula Salad, crisp baby arugula, cherry tomatoes and marinated artichoke hearts tossed with fresh lemon and extra virgin olive oil, topped with pan-roasted pignoli nuts and shaved grana padano cheese. She thought her salad was very good. 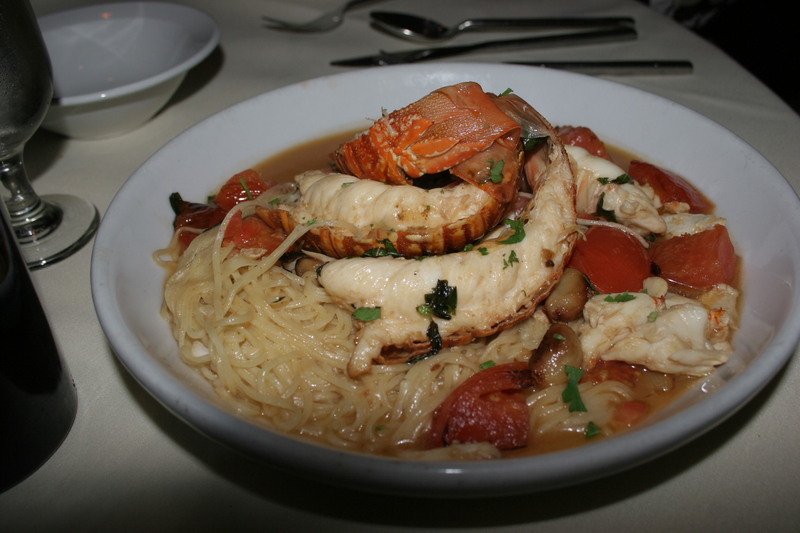 One of the entrees that we enjoyed was the Cold Water Rock Lobster and Crabmeat, sauteed with Roma tomatoes, roasted garlic, white wine and lemon over capelinni. Carol and Joe thought the lobster consisted of generous portions and was well prepared. 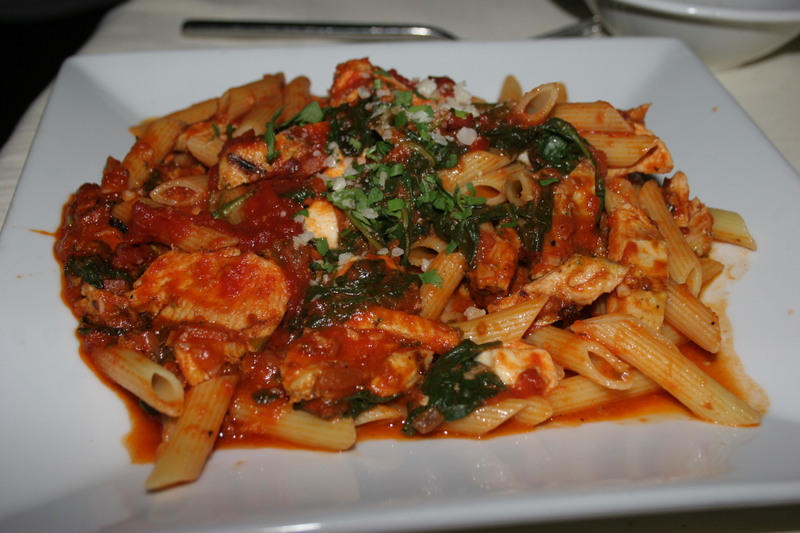 Kathy had the Penne a la Amatriciana, tossed with grilled chicken breast, spinach, prosciutta, pomadora and fresh mozzarella. 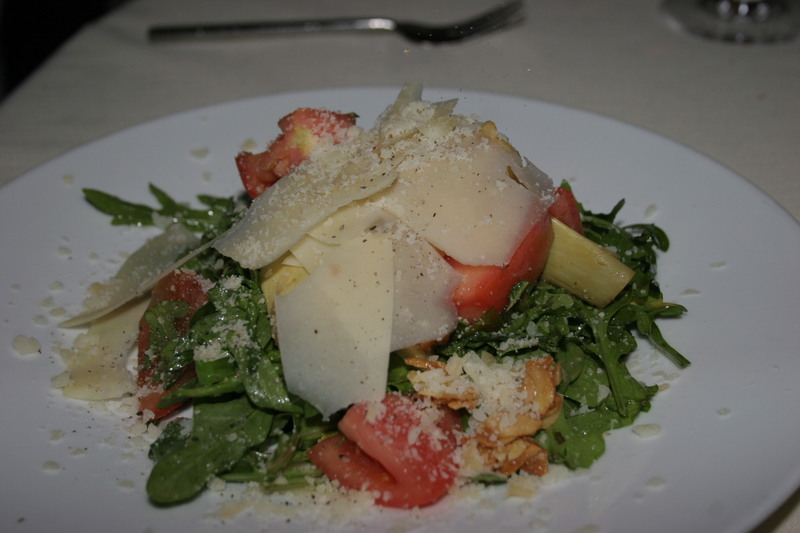 Nice rich flavors and expertly prepared pasta had Kathy pleased with her entree. 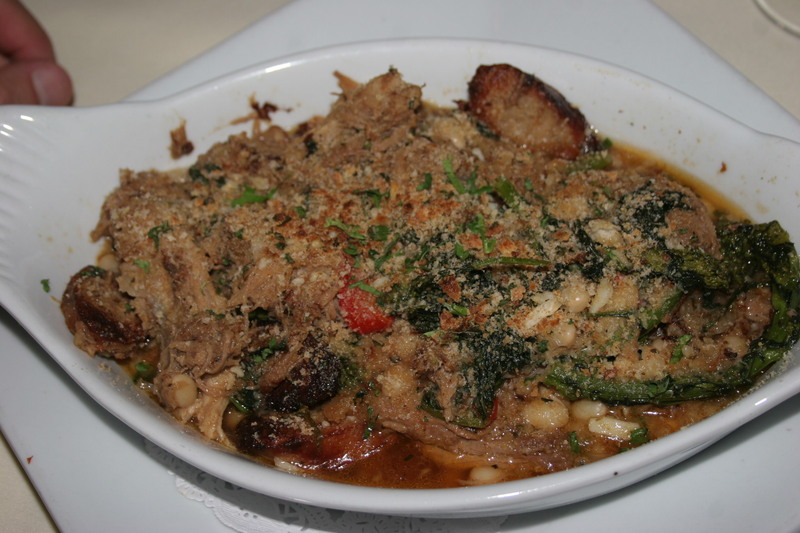 I went with the Roast Pork Casoulet, slow roasted pulled pork shoulder cooked with sausage, cannellini beans, roasted peppers and broccoli rabe. This wasn’t quite as good as my crepe appetizer but it was still a tasty dish and another generous portion. We skipped desserts but all of us were pleased with our dinner at Bacio and we were glad we had driven the extra distance. I went with a 2008 Haymon & Hill, Reserve Selection, Pinot Noir, Santa Lucia Highlands which was a decent pinot with cherry and raspberry notes with a little spice and a medium finish. To go with my steak I stepped up to a heartier red, the 2008 Hess, Allomi Vineyard, Cabernet Sauvignon. Dark blackberry flavors with a hint of smoke and cedar, smooth tannins and a lingering finish made this a good choice for the filet mignon. 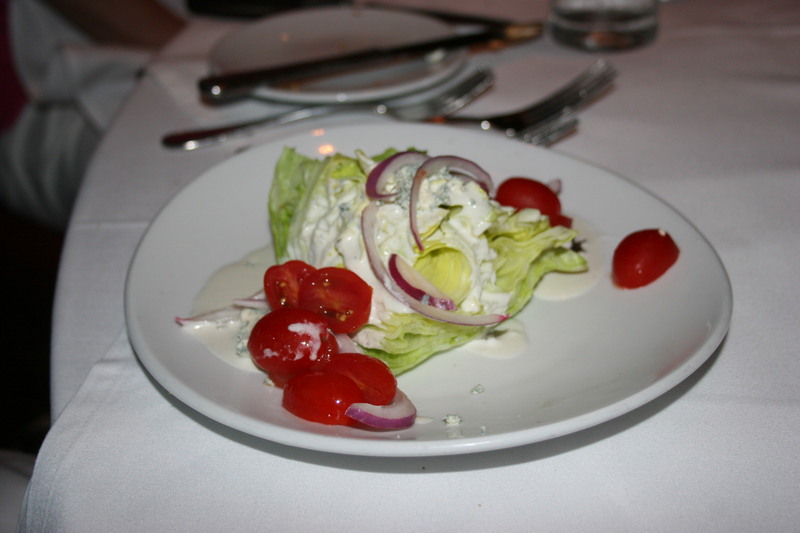 Most of our table split the Wedge Salad, crisp iceberg lettuce, grape tomatoes and crumbled blue cheese. 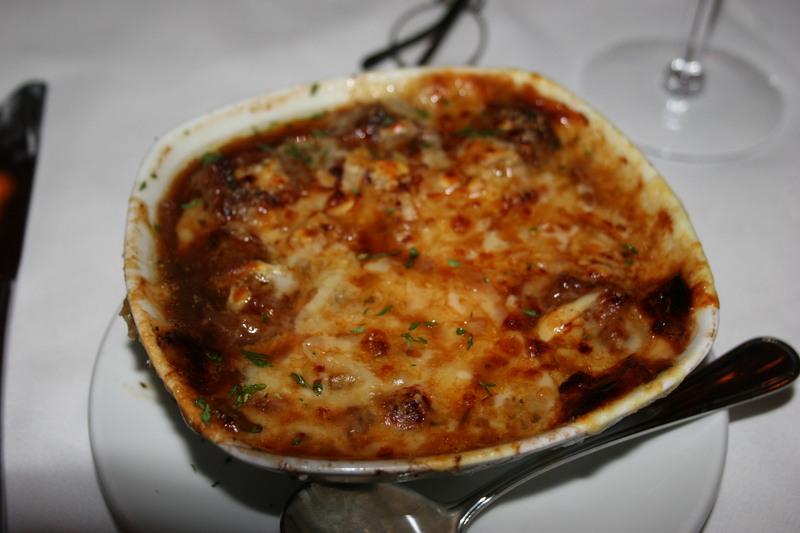 I had the French Onion Soup baked with swiss and parmesan cheese. 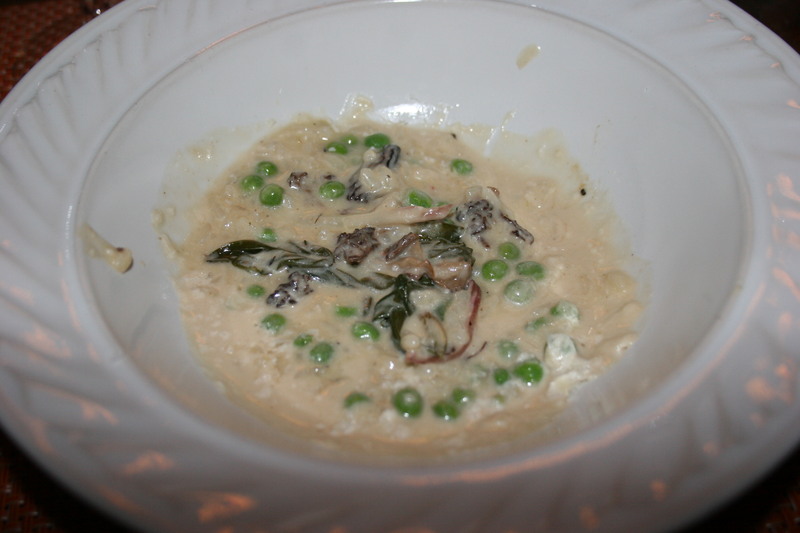 This had tons of great flavor and was the perfect pre-steak starter. My filet was cooked medium and we shared several sides. The most notable of the extras was the Fleming Potatoes with cream, jalapenos and cheddar cheese. 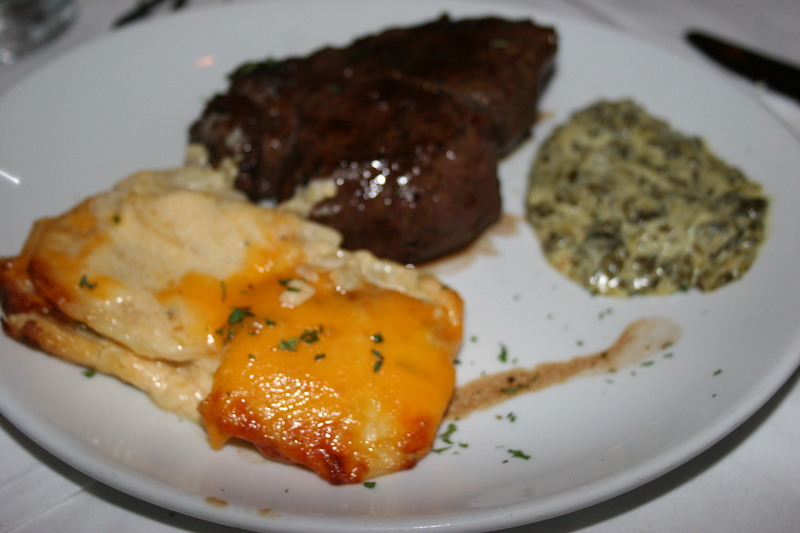 This gooey concoction is the perfect match for the USDA prime filet served with peppercorn sauce and a touch of butter. We also shared some cream spinach and asparagus spears. 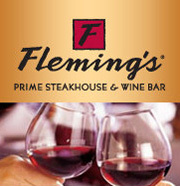 Flemings can be counted on for a consistently good meal and top-notch service.